Industrial robots work 24 hours a day, seven days a week, right? So you bought a robot placed them on site and started production. It looks that robot works all the time, but are you sure? To build „average” passenger Mercedes 3,49 MWh is required. A lot of that is consumed by industrial robots on BIW (Body-In-White) lines. And what they mainly do? Nothing. As you see „typical” robot during year spends most of the time standing in one position and waiting for: end of the weekend / damage repair on another line / program number from PLC / release of interlocking zone. 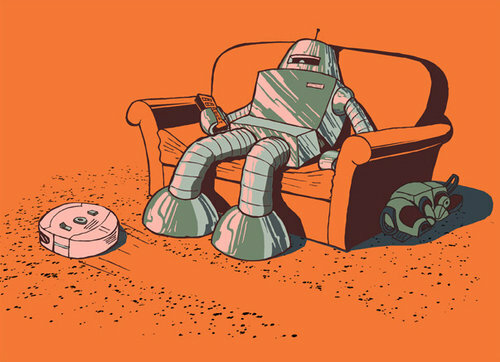 Modern robots could quite good manage their energy usage during long pauses but problem is in short ones. During short pauses robot holds it’s positions using servomotors, without using mechanical brakes. And this require much more energy. Of course to save some kWh, we could force robot to use brakes after shorter period. But this few second less caused that robot during his whole life make a few million braking cycles more. So we still have to decide whether is better to waste some electricity or service brakes more often.